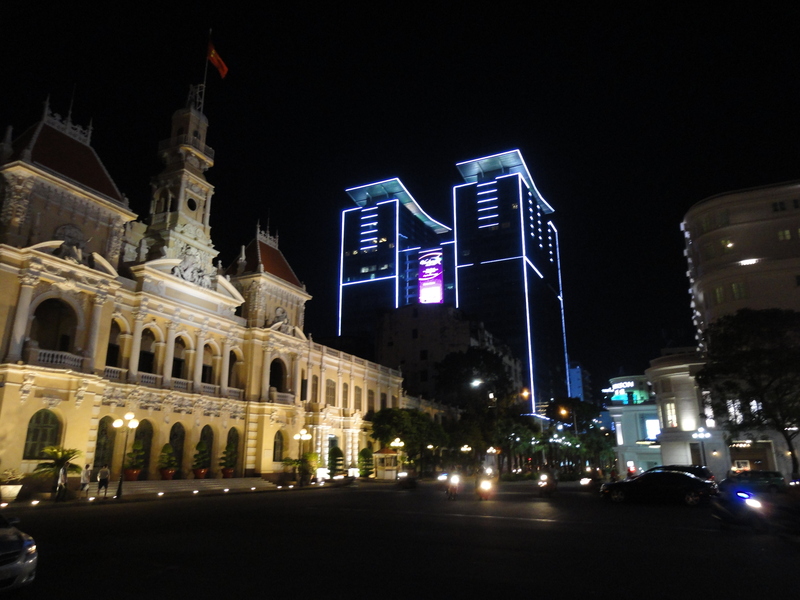 For my second day in HCMC, it was time to experience the city all by myself after having had a good tour with Nam from Saigon Hotpot the previous day. 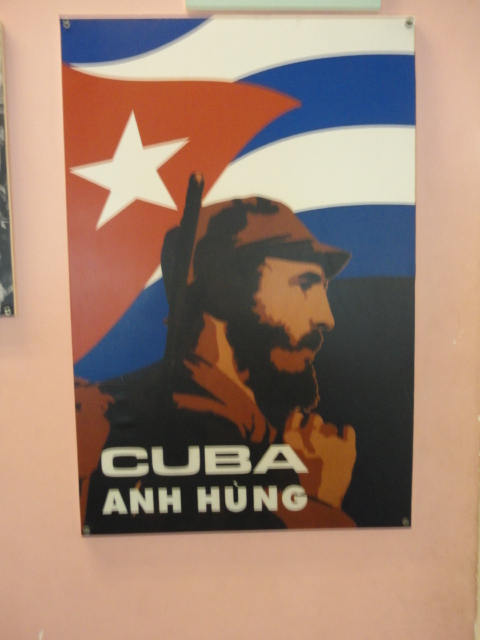 My plan was to go to the Revolution Museum, the military museum (War Remnants), and take in some colonial buildings in the area. 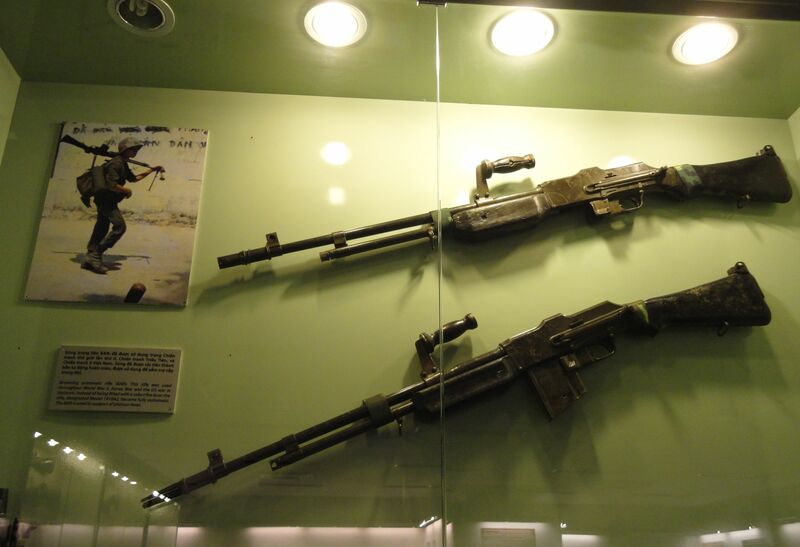 I was particularly eager to visit the War Remnants Museum, which was described as one of HCMC’s best sights in many sites and articles online. 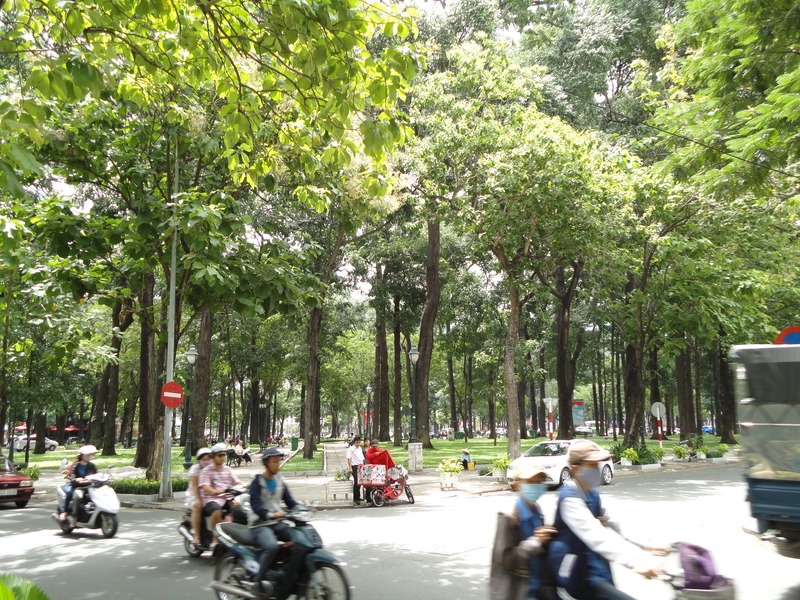 I set off from my hotel, passing through the large park right opposite all the hotels and restaurants along Pham Ngu Lao. 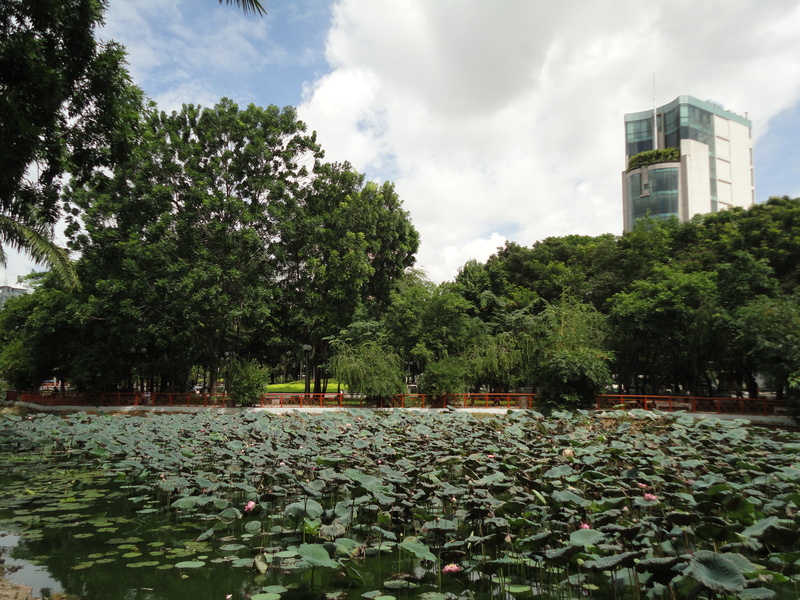 It featured a large, lotus-filled pond and walkways framed by palms and other tall trees. It was quite pleasant and wouldn’t be the last park I’d walk through in HCMC, a big contrast with Taipei where parks are small, few, and often had more concrete than trees and grass. 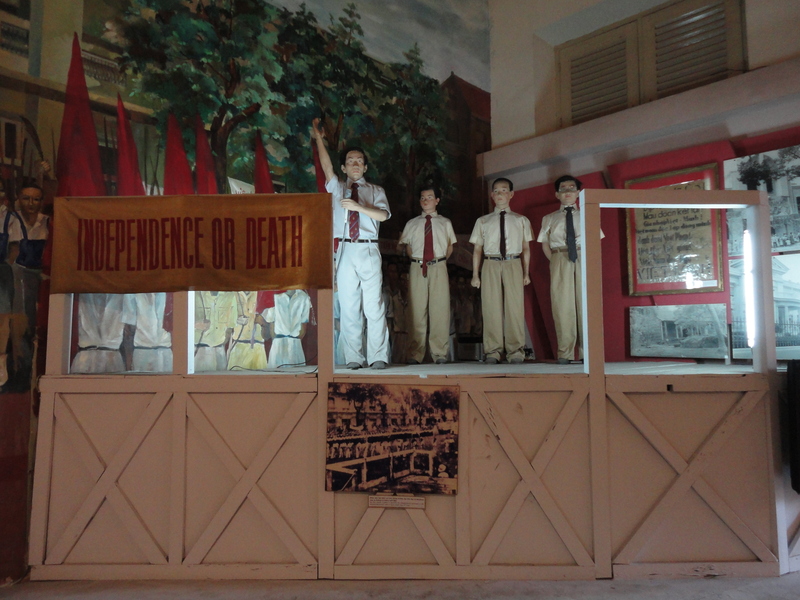 First, I went to the Revolution Museum, which focused on Ho Chi Minh and the revolution against the French which ended with Vietnam’s victory in the 1950s. 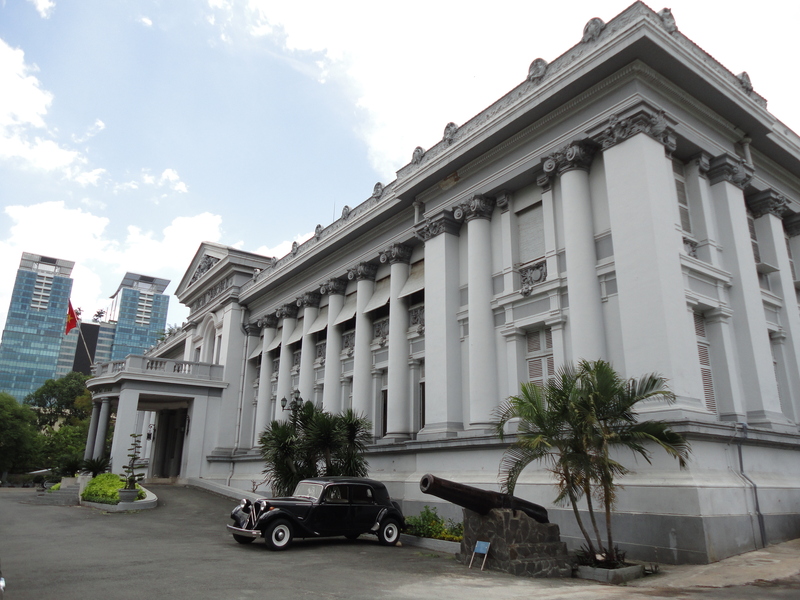 Housed in a elegant gray colonial mansion, as many Vietnamese museums are, the museum’s name was changed to the City Museum, possibly reflecting a move to tone down the militarism and expand the museum’s scope. It also makes sense to have a museum for the city itself. 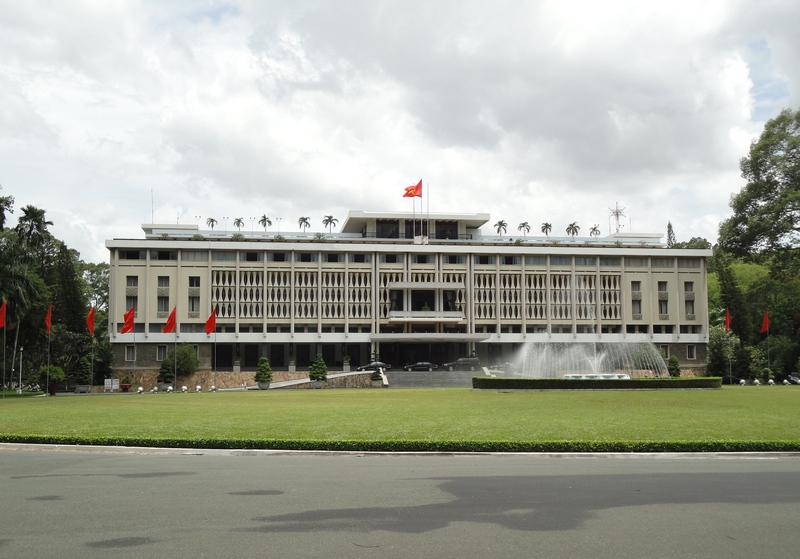 I also found out recently via a website this was the former residence of the French Governor and the final home of South Vietnamese president Ngo Dinh Diem, the corrupt strongman who eventually died in a coup. 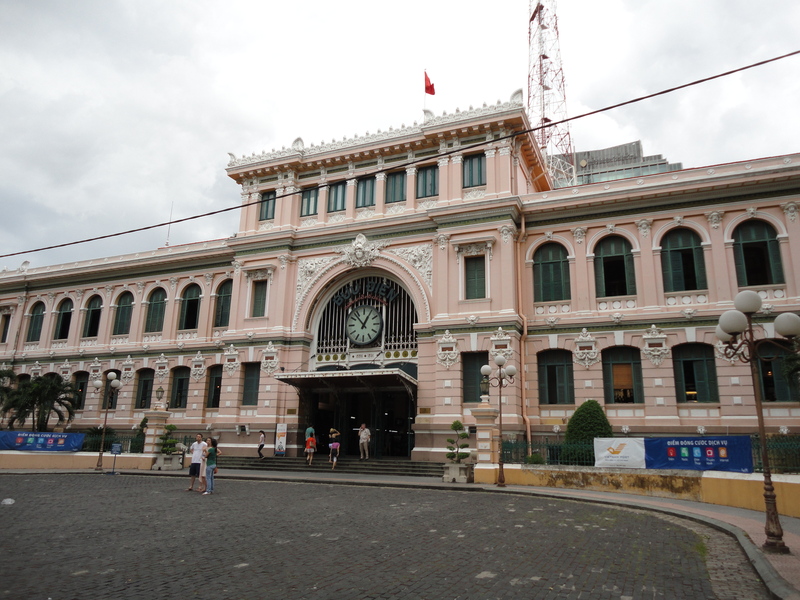 The city part of the museum consisted of a few ancient artifacts found in Saigon, which had been formed in 1698, and a range of cultural objects including wedding clothes, instruments and even ancient Vietnamese coins. The revolution part featured photos, letters, weapons, uniforms, and even a pot and pipe that had been used by revolutionaries during the revolution. The displays were quite impressive, full-size human mannequins making speeches on stage or defiantly wielding weapons. One of the main attractions was a bicycle, fitted out with giant bags piled atop it and looking as if it had just been brought in from service on the Ho Chi Minh trail, when the North Vietnamese moved supplies on foot and on bikes through jungle and hills to their allies down south. 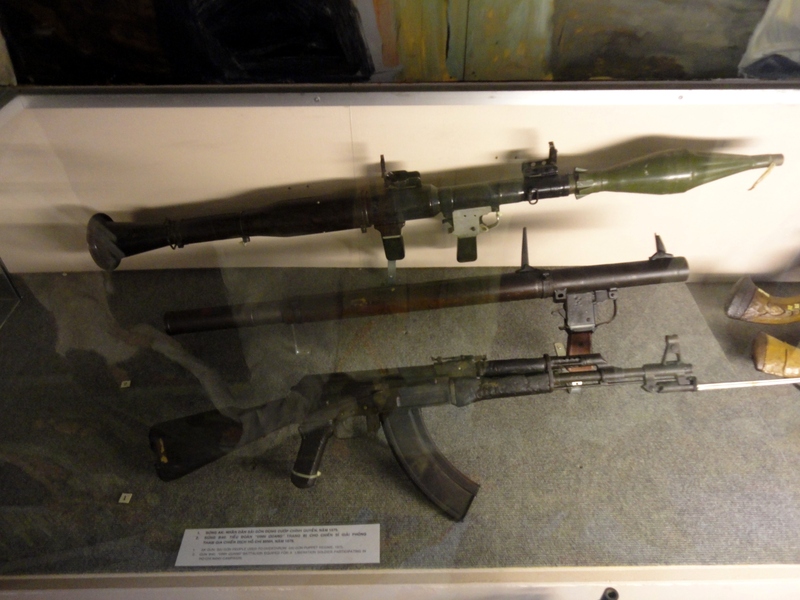 There was a lot of serious firepower on display too such as rocket propelled grenade launchers, grenades, and machine guns, and even the humble pistol. 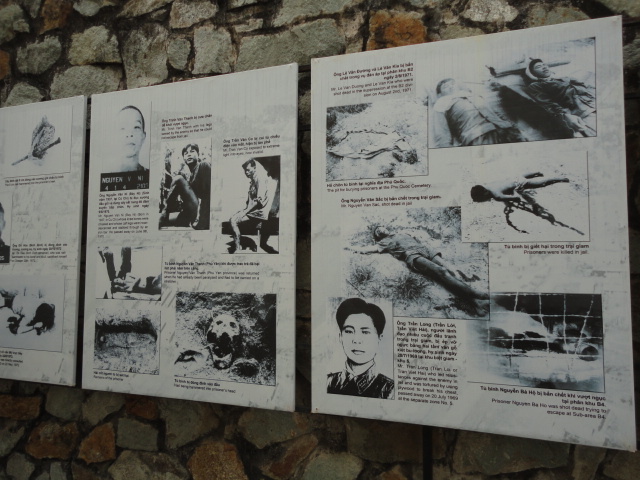 On the ground floor, there’s a stairway at the side that leads down to an underground shelter that had been built by Ngo Dinh Diem. There weren’t many people, especially locals at the museum. 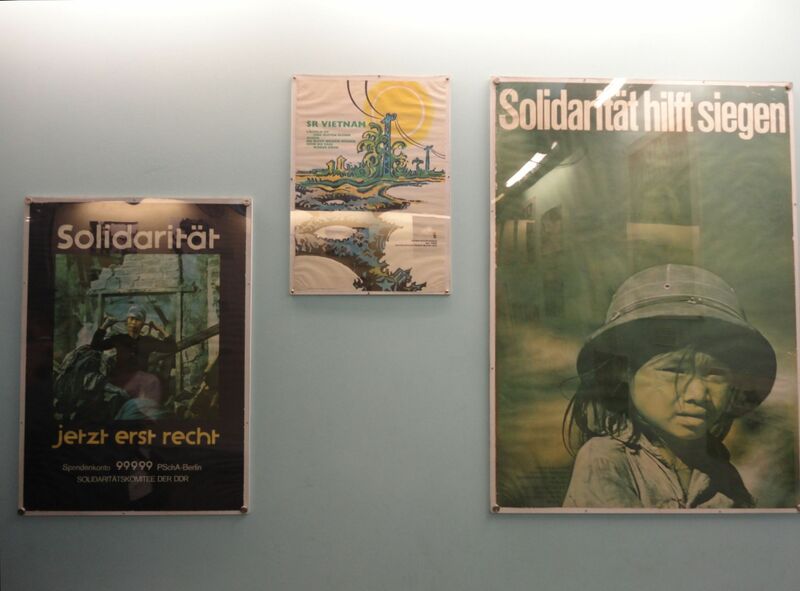 Nam had told me that not many Vietnamese found this museum interesting, which wasn’t surprising given that the museum was mostly propaganda, promoting the heroism and glory of the Communist party. 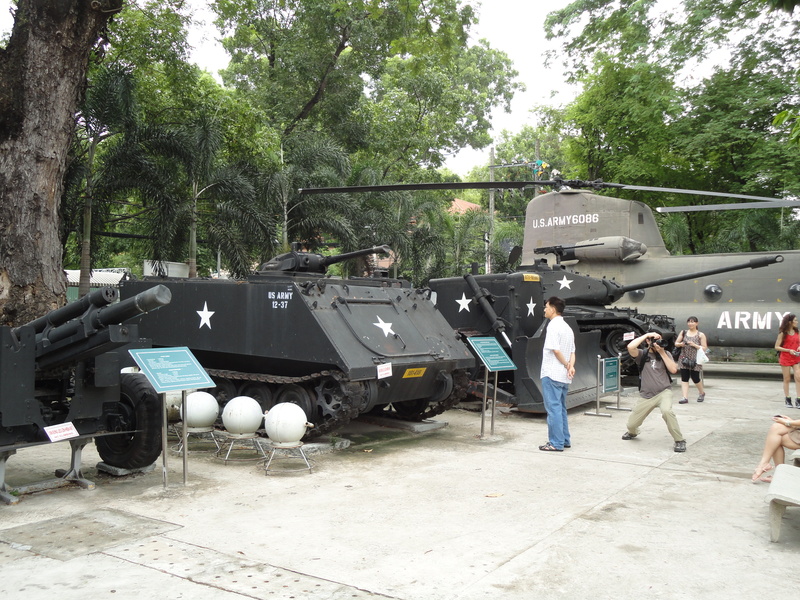 Around the building were several Vietnam War-era fighter planes, tanks, and artillery pieces, another common feature of Vietnamese museums. What was annoying though was being hassled by drivers offering city tours on the outside, one of whom took it upon himself to appoint himself as my driver and told me he’d wait for me when I came back out so he could take me on a tour. When I came out about one hour later, the damn guy was actually there though thankfully he left me along when I ignored him. 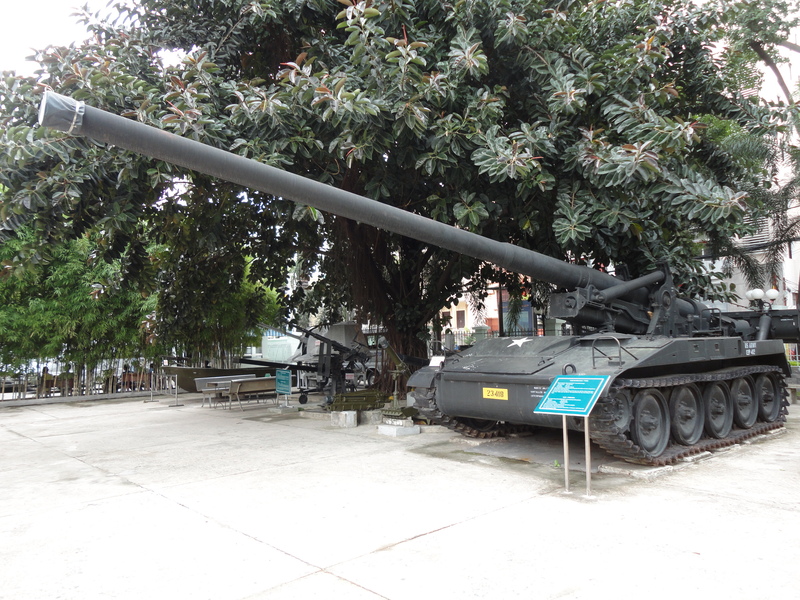 As I walked to the War Remnants museum, I encountered more of these pushy drivers. It was really silly since I was literally minutes away from the place’s sights so there was absolutely no reason I’d want a driver. 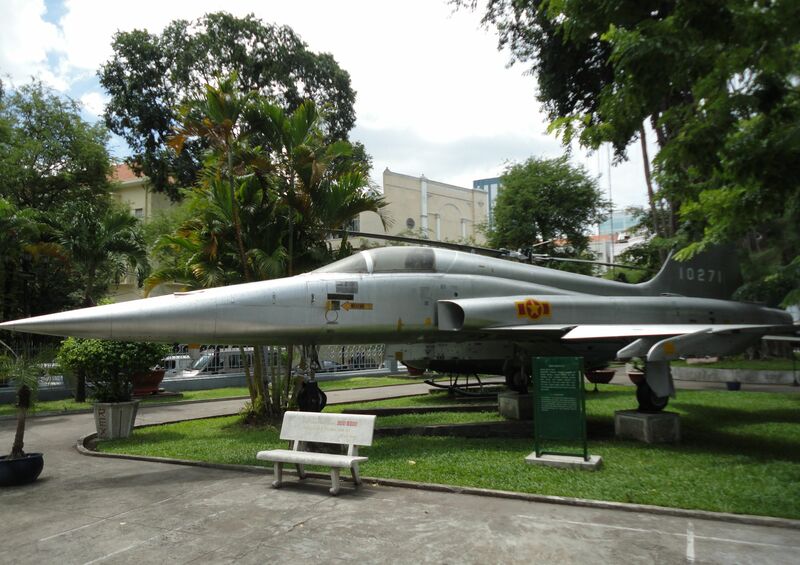 F-5 fighter jet, an American-made airplane, which was flown by a North Vietnamese agent in the South Vietnamese air force to bomb the Reunification Palace (when it was the office of the South’s president). That explains why it is in North Vietnamese colors. 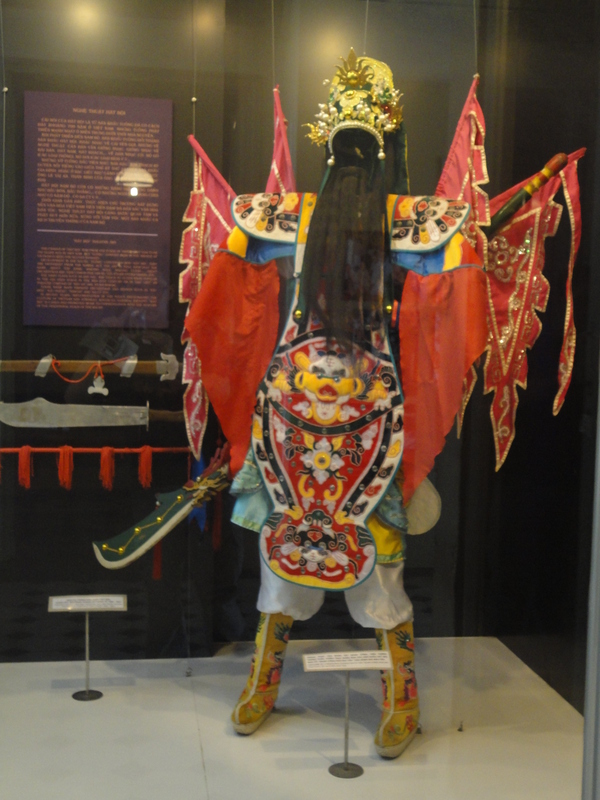 Vietnamese theater costume, which looks similar to Chinese Beijing Opera costumes. Hotel with a rather interesting and nice design. Another park in HCMC near the HCMC museum. 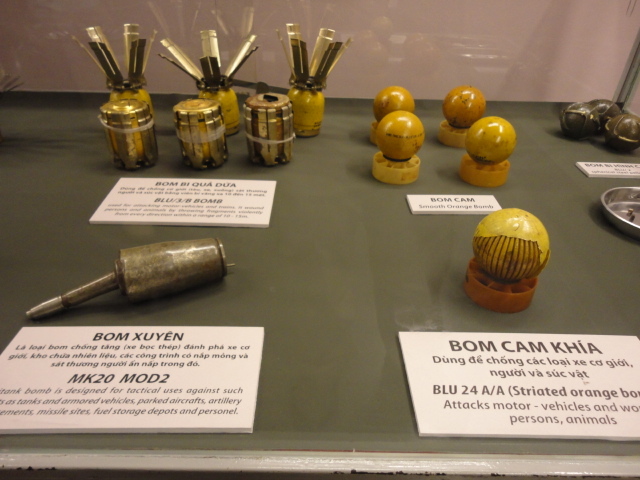 Serious firepower in the HCMC museum. Usually, a guy will consider himself lucky to have a comely female clutch his forearm tightly and say don’t go. Except if this happened inside a market stall and the guy doesn’t want to buy anything. It’s striking that just after posting about amusing female vendor market interactions in Ho Chi Minh City last week, I’d experience something similar one in Beijing, though not so amusing. A few days ago, I was at the Yashow indoor market, a squarish mall actually, in Sanlitun, which sells a lot of clothes, especially replicas, a place recommended by a colleague. Inside, the place was filled with open stalls in all directions which kind of resembled a maze. Each stall was roughly the size of two or three cubicle spaces. There were quite a number of non-Chinese tourists here, even including tour groups. I was looking for a coat jacket and I stopped at a few stalls to check out the goods and ask the prices, which you don’t accept at all. It seemed straightforward enough. I was looking at a few decent coats at one stall when a lady came up to me and said I could try them on. Sure, I replied, and I did. Where’re you from? Singapore?, she asked. I told her Hong Kong, and she said “oh, well you all look similar” with a laugh. “We’re all Chinese,” I replied. Anyways I asked the price and it was high, but not surprisingly she reduced it. However I decided not to buy and started to leave when the lady placed her hand on my arm. Come on, she said, clutching a calculator with her other hand. “I’ll give you a better price. And look at this jacket again, it’s good quality,” she said. Well, I said it’s alright and turned to leave again. The lady put her hand on my arm again, except this time she was grasping it as she pulled me back into her stall. Wait, I’ll give you a better price, she said. It’s ok, I replied, “I’ll look around first and maybe come back.” Unbelievably the hand went on my arm again and this time the grasp was tighter. By this time, I was a little stunned and to use a cliche, couldn’t believe this was happening. I had to pull away, with the lady still holding on, but finally I managed to extricate myself. OK, I’ll sell it cheaper, she shouted. 200! 150! The shouting part happened with several other vendors when I walked away, since bargaining is an accepted part of buying. Actually it’s mandatory since the real price is always much too high – after all, these are mostly replicas, whether of Adidas or Timberland. While for some people, walking away is just a tactic, for me it’s usually for real since I don’t tend to buy things right away. I did end up buying a decent coat from a male vendor. I bargained the price down quite a bit though I wonder if I still paid too much since he seemed to agree too easily. Anyways, when I think back at this, I can’t help laughing a little. But trust me, it was more than a little harrowing when it happened, especially when considering how those helpful friendly female store clerks morphed into tenacious, forceful creatures within a split second. 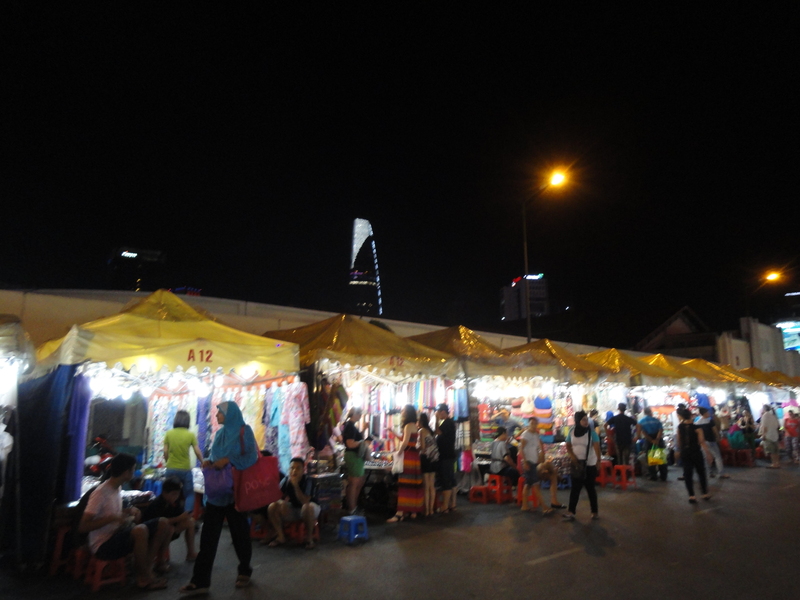 In contrast, the caresses by the female vendors at the Ben Thanh indoor market and the comical pleading and theatrical blocking by the female vendors at the nighttime market at the same place, seem downright gentle. Sometimes, it seems like living in Beijing is like an adventure. The most basic situations can turn into the unexpected. Of course, China can be very beautiful, pleasant and relaxing. Take a journey across China in this video of timelapse photos of cities and landscapes. Pham Ngu Lao St is HCMC’s backpacker/tourist district, supposedly the local equivalent of Bangkok’s Khaosan Road. Hopefully Pham Ngu Lao never becomes as loud, seedy or notorious. 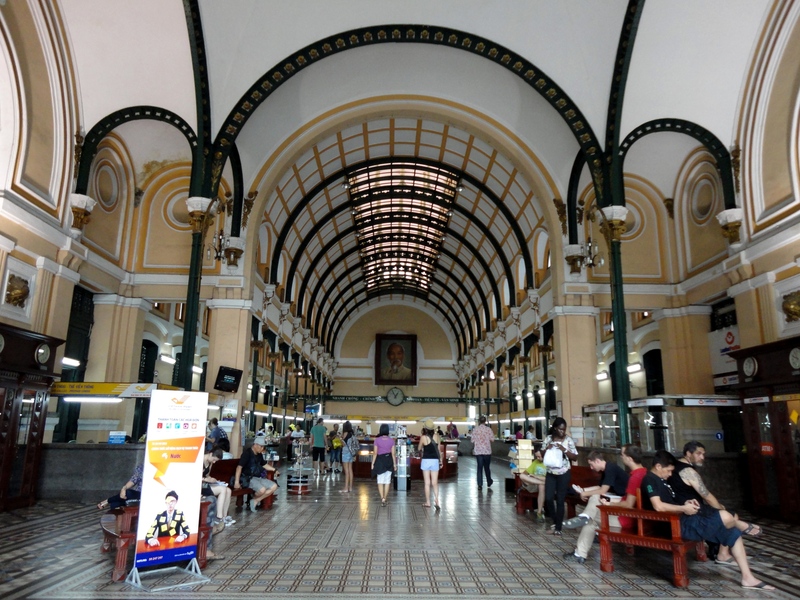 While it’s great that hotels, restaurants, and travel agencies fill Pham Ngu Lao, one of the best things is that a major market and some fine historical buildings are just minutes away. Looking back, it seems so comical and flattering, but at times it was a bit too much. On the flipside, I had a male vendor ridicule me in Vietnamese to his fellow vendors after I asked him about some magnets and then walked away without buying. He spoke some Vietnamese in what sounded like a mocking tone and his fellows burst out laughing. 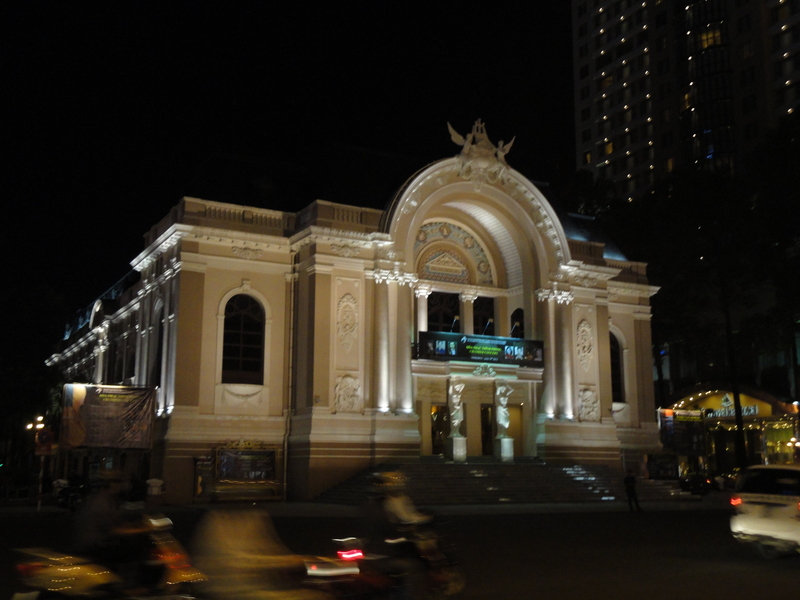 Besides the market, if you continue walking along the main road you will hit a really fancy part of town where you can check out the City Hall and Saigon Opera House, both colonial buildings. The City Hall is very nice and you can walk right up to it, situated at the end of a driveway with luxury brandname stores on both sides. 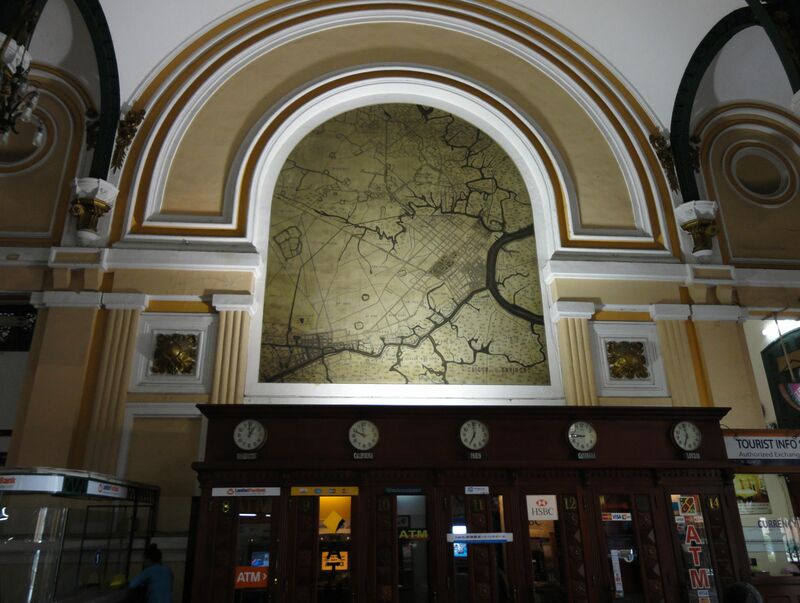 The Saigon Opera House has an arched doorway and a long rectangular shape, which I didn’t see properly since it was in the night. 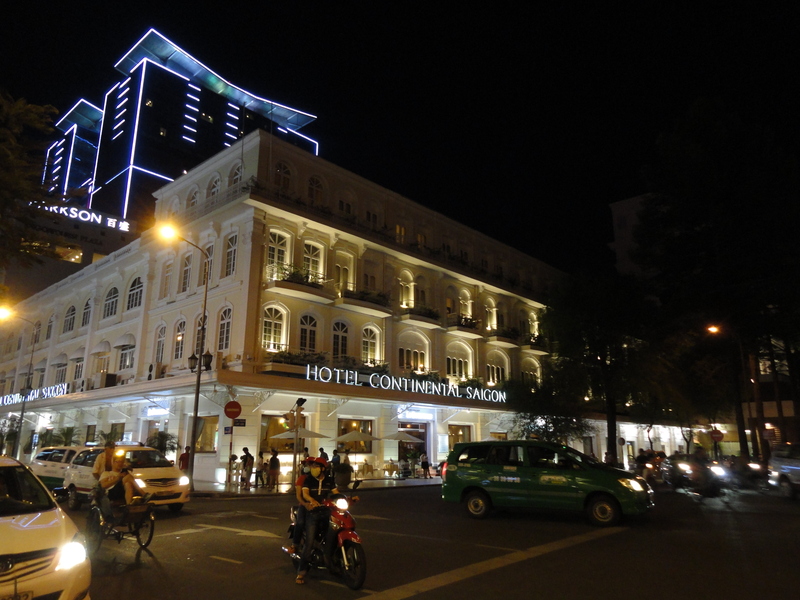 There’s also the Hotel Continental Saigon, a hotel famous for its role during the Vietnam War for being the haunt of American journalists. 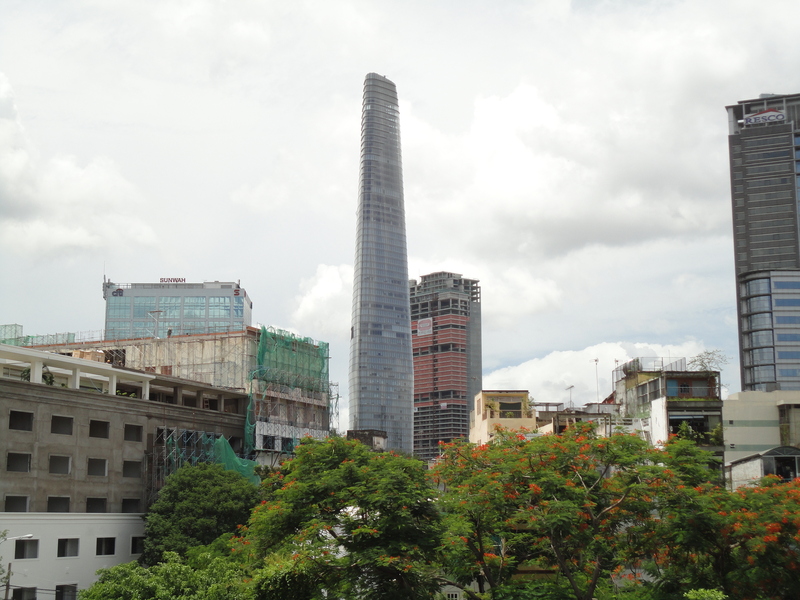 Back to the market, when you cross the street to an open space and face a roundabout with a statue of a man on a horse (14th century Vietnamese hero General Tran Nguyen Han), there’s a fine view (the first photo in this post) of the Bitexco Financial Tower, Vietnam’s tallest skyscraper. 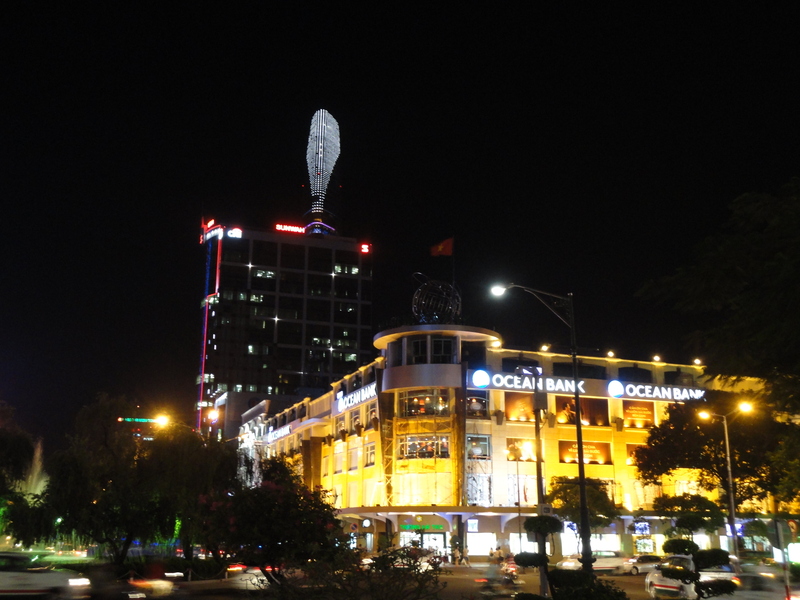 Shaped like a leaf, or a dagger, and lit up at night, it’s a very nice sight It’s also a reminder of HCMC’s economic vitality and how Vietnam is a nation in flux, communist but following a similar path as China. 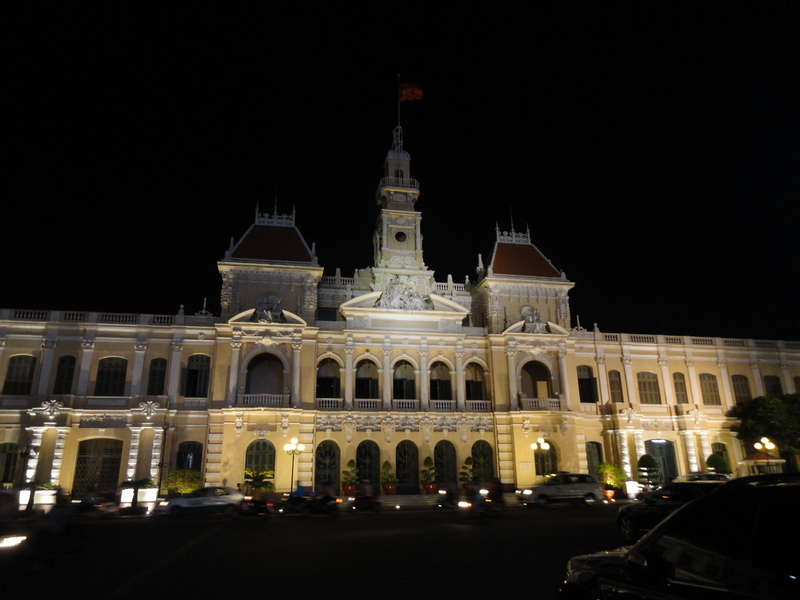 So back in June on my Vietnam trip, my next stop after Hue was Ho Chi Minh City, or Saigon which it is still popularly known as. 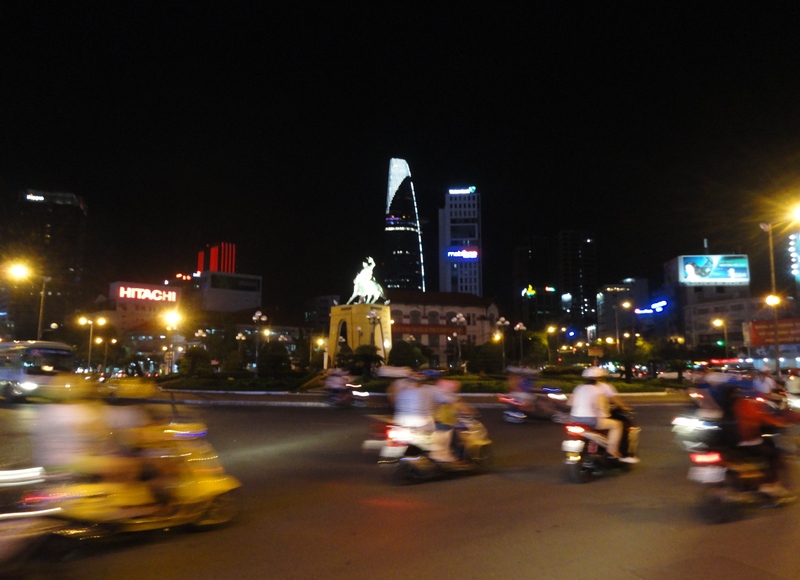 It may not be the capital, but it is Vietnam’s commercial powerhouse and a famous city, mostly due to its role in the Vietnam War as the capital of South Vietnam and where American troops and journalists had a major presence. 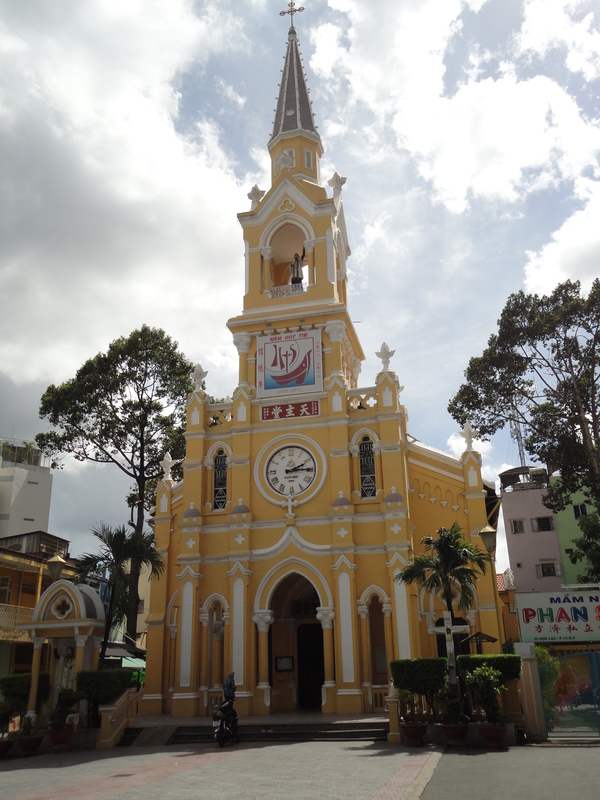 It is located in the south, near the Mekong river delta, in perfect contrast to Hanoi which is in the north. I left Hue for Da Nang, where I took a flight to Ho Chi Minh City. My Jetstar flight went smoothly and it got into Ho Chi Minh City airport on time, which was more modern and bigger than Hanoi’s. However I encountered a slight issue very soon, as I mentioned in my previous post about scams. I approached a taxi counter right before you exit customs, and showed the guy my hotel address, only to be given a larger amount than expected. 320,000 (US$16), he said. From websites, I knew the amount was around US$10, so I declined politely and was about to walk off when he called me back. 200,000 (US$10), he said, and I agreed. My driver didn’t speak any English so my ride into the city was mostly quiet. Along the way, he did tell me the name of a church when I asked him. My hotel was in a side street near the end of Pham Ngu Lao, which is the city’s main backpacking drag, full of hotels, bars, and travel agencies. When we arrived, the security guy came and helped me carry my luggage inside, which was pretty good; I’d also experienced that in Hanoi. My hotel was a little underwhelming, being the newer and presumably downscale sibling of a hotel with which it shared a name, but with a “2” being added at the end. Parts of the interior were still being worked on, and the two guys at the front desk were respectively friendly and cunning. 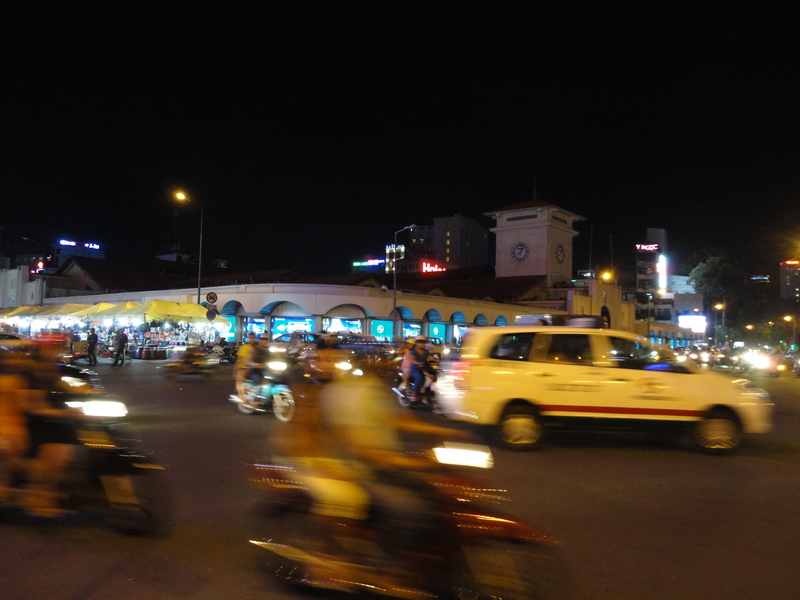 I walked to Ben Thanh market that night, taking in the sights of Pham Ngu Lao and its myriad eating places, hotels and souvenir shops. The market was just about 10 minutes away from my hotel. 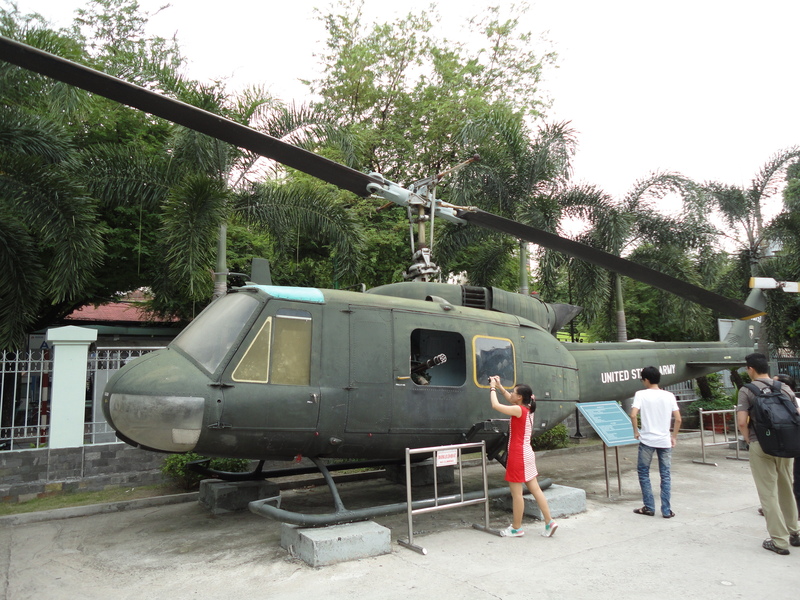 The next day, I did a free daytour with Nam, a student guide who was a member of Saigon Hotpot. Like the organization in Hanoi who I also did a free tour with, Saigon Hotpot was made up of mostly university students who volunteered to take visitors around the city. Nam was studying engineering and had a really good knowledge of temples and Buddhism, certainly much more than me. 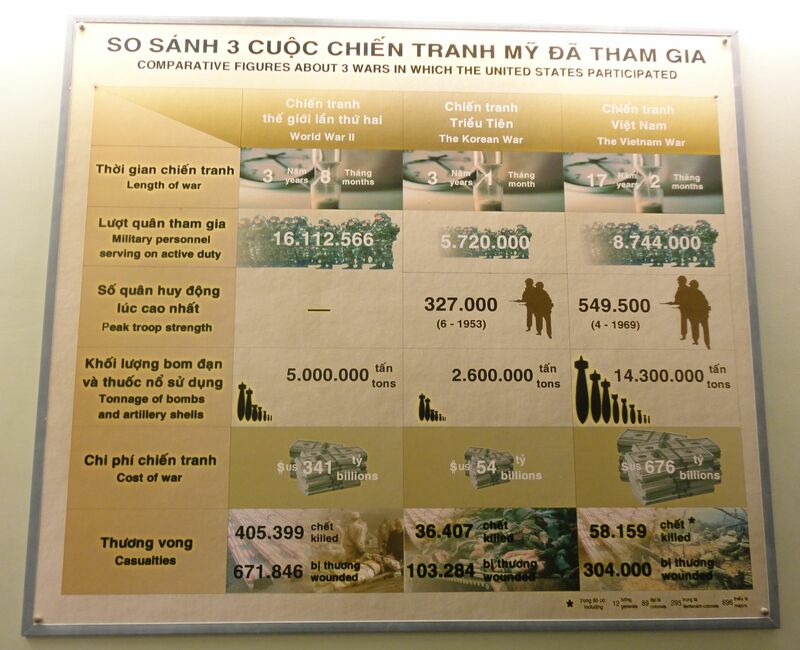 As with my female guide in Hanoi, Nam’s English was remarkably fluent. I’d wanted to go to the History Museum, the Jade Pagoda, and “Chinatown”, and we went to all three. 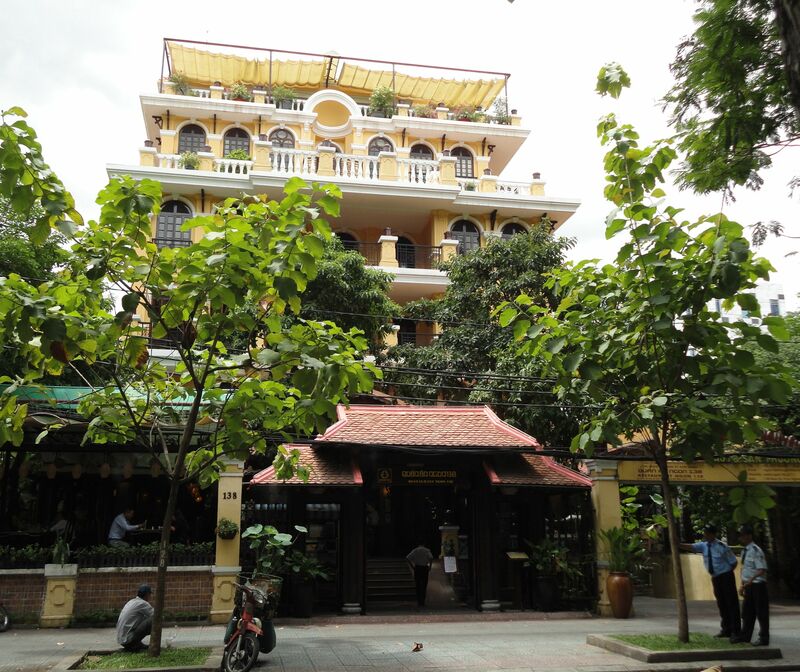 Whereas in Hanoi, my guide had called taxis to take us, Nam had us take the bus at the station near Ben Thanh market, which was interesting and cheap as well (not that the taxis in Hanoi were walletbusters). At one point, a lady on the bus stood up and began making a pitch to other passengers about kitchen tools, which she was selling. It was of course very surprising, and a first for me, though it is a normal event according to Nam. 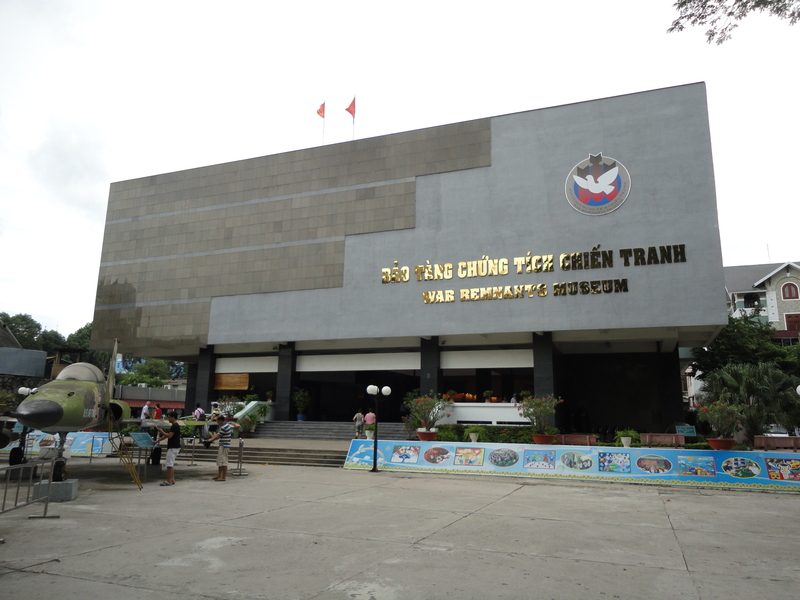 The Museum of Vietnamese History was similar to its counterpart in Hanoi, but it’s still worth a visit if you have time. 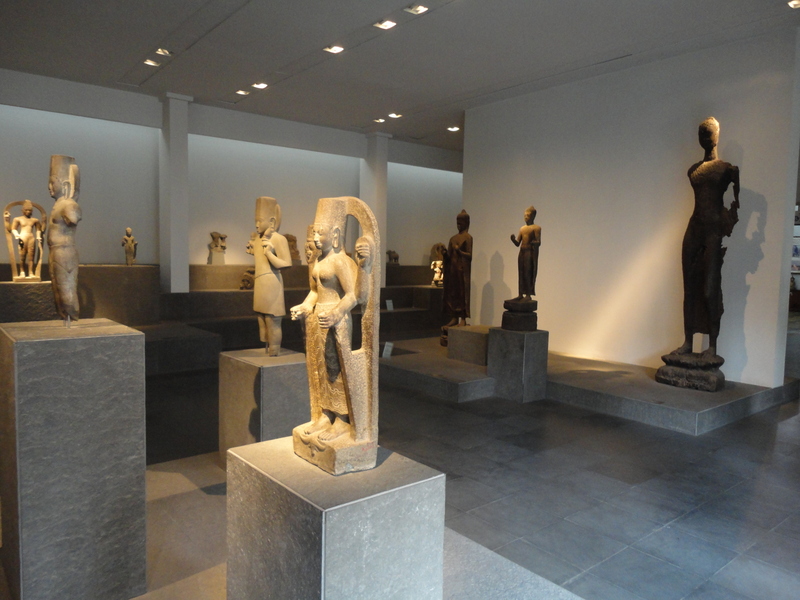 The exhibits are all on the first floor and include military weapons, Champa statues, and ethnic artifacts. 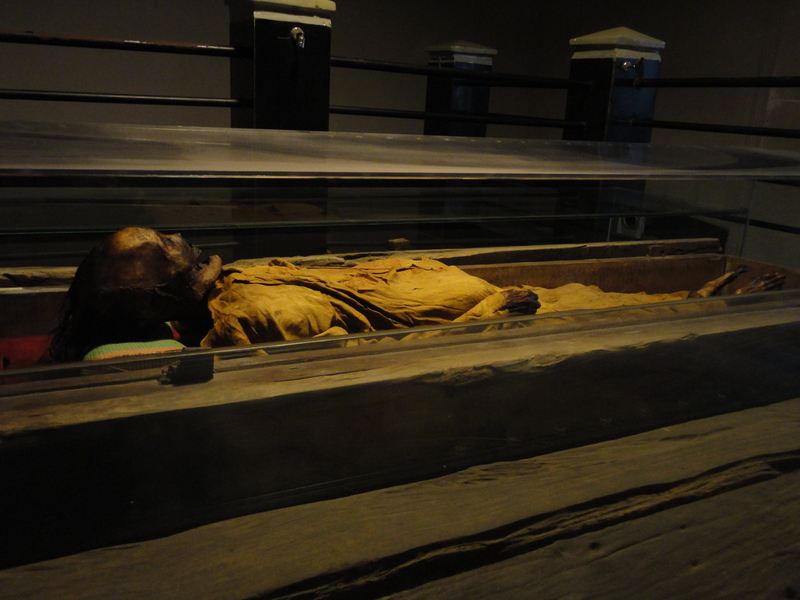 The most famous exhibit is an actual mummy, laid out behind a glass case exposed in all its decaying glory- a noblewoman who had been buried in the 19th century. 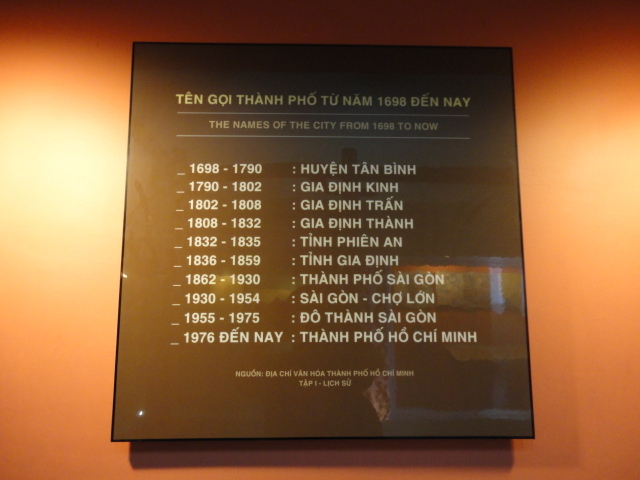 There’s a more extensive display of the Oc Eo culture, which existed close to Ho Chi Minh City (Saigon). We had lunch at the “Lunch Lady,” a local semi-celebrity who’d gotten famous after being visited by Anthony Bourdain. 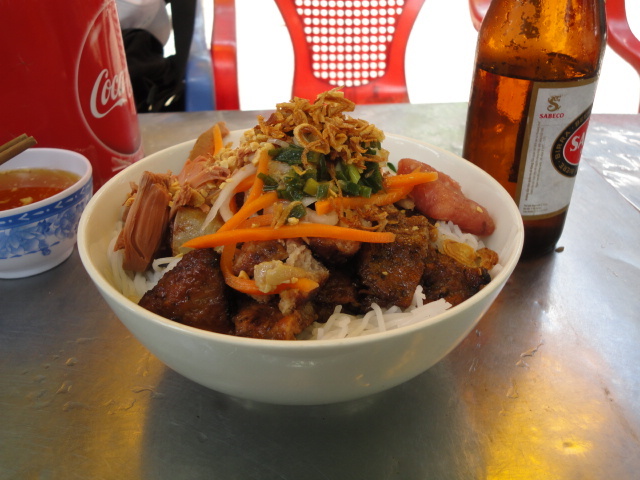 This wasn’t a high-end restaurant, but a typical outdoor Vietnamese foodstand that served noodle or rice dishes. True to her reputation, the Lunch Lady had a lot of customers, mostly office workers. Nam ordered for us, which turned out to be delicious pork noodles, and it was nice to sit down at one of these places to eat at last. Though, I couldn’t help notice the rat running around a few meters from us, a sight that I’d see again in Bangkok. 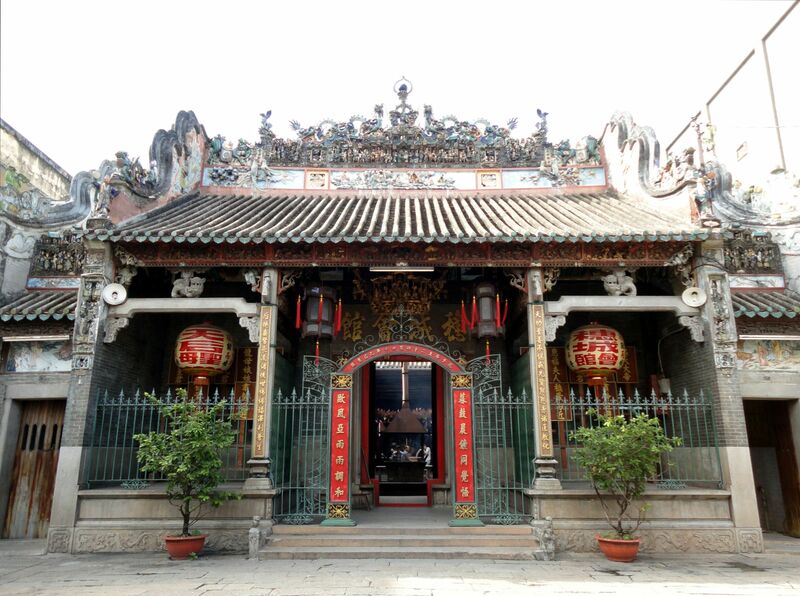 The Jade Emperor Pagoda was a red temple that had been built in the early 20th century by Chinese-Vietnamese. Despite being called pagoda, it’s not actually a tower but a two-storey temple. The temple’s roof resembles that of Chinese temples with its continuous curved layers, but with one striking difference- the colorful decorations on top and on the roof corners that feature dragons and people. Outside the temple door, vendors sold birds and little turtles for believers to purchase and release. This is due to a Buddhist belief that setting animals free can earn a person merit. In Taiwan, some people also do this, releasing fish or birds in large numbers on certain days. It has dubious effects on the environment as not only do some of these animals die in the wild, or damage the local ecology, but as Nam said, end up being caught again, or fuel the capture of more wild animals just to be sold and released. The courtyard features a fish pond but more popular is probably turtle pond on one side, filled with turtles that had been released by believers who’d bought them from the vendors. It wasn’t as pleasant a sight as one might think. It was very overcrowded and dirty, and dozens of turtles were climbing up all over each other on the sides of the pond. 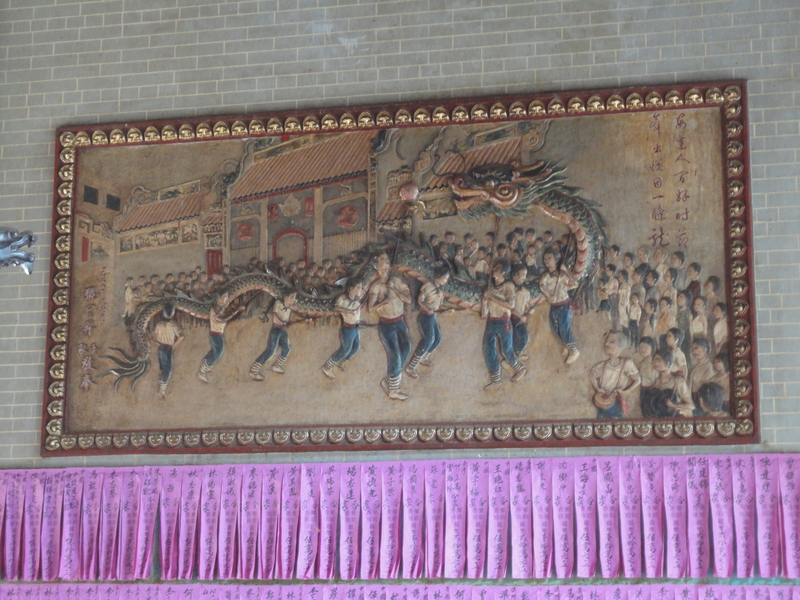 Inside the temple, there were several halls, each with a main altar featuring a different deity, similar to Chinese temples. The main reason people visited this pagoda was for women to pray for a child. 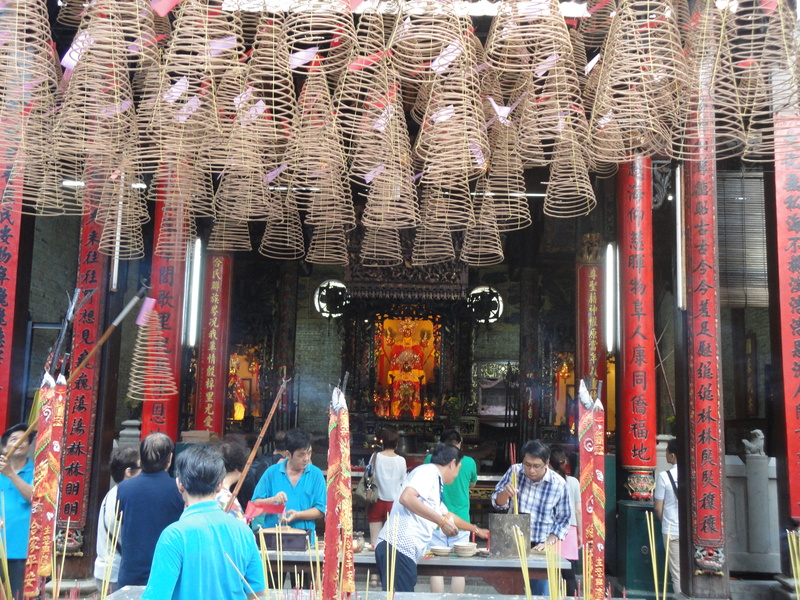 There was a second floor with more halls including one with the goddess of mercy Guan Yin. Nam did a fine job explaining the different deities and practices, helping me learn new facts and making me feel a little ashamed that I knew so little about my heritage when it came to Buddhist temples and gods. 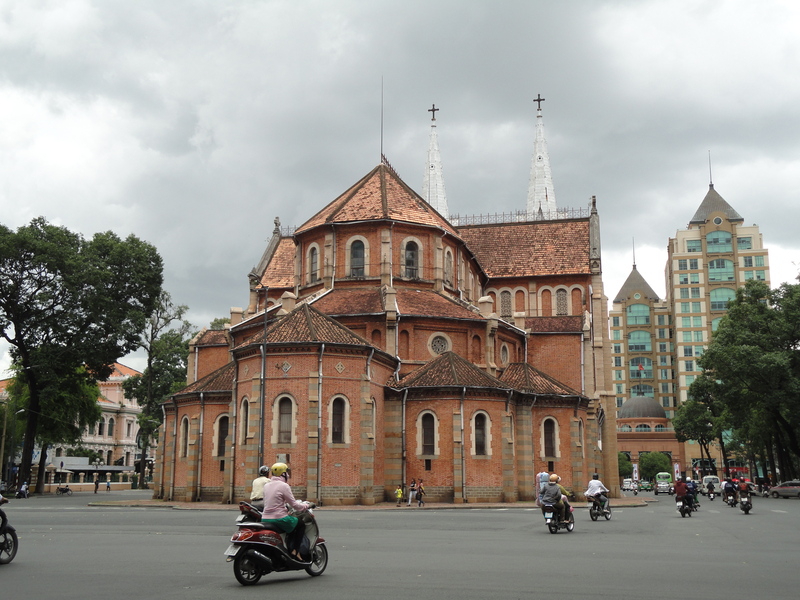 Finally, we went to Cholon, the “Chinatown” of Saigon. This was a historic part of the city, where much of the local Chinese population lived and traded. Yet, as Nam explained, this wasn’t exactly Chinatown since many of the residents and stores were not Chinese. I didn’t mind too much. This area was indeed full of bustling trading, with cloth stores especially numerous. 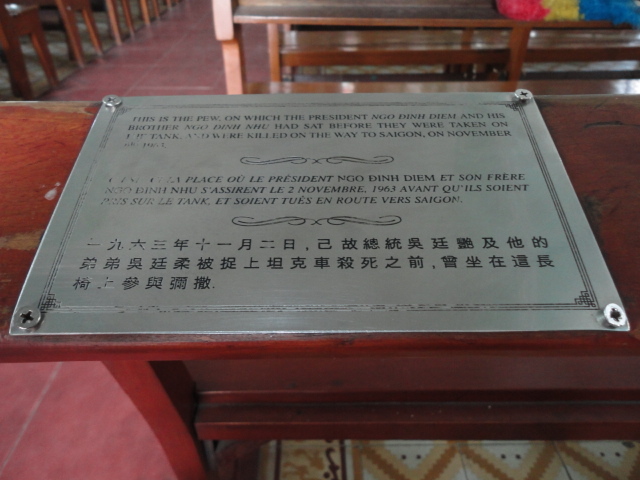 There was the Binh Tay market, a large market filled with food and dry goods stalls, and that also has a memorial to the wealthy Chinese businessman who financed the market. There were several restaurants and businesses with Chinese signs as well. We went to a couple of old temples, featuring similar exquisite rooftop decorations which far outdid those on Chinese temples. 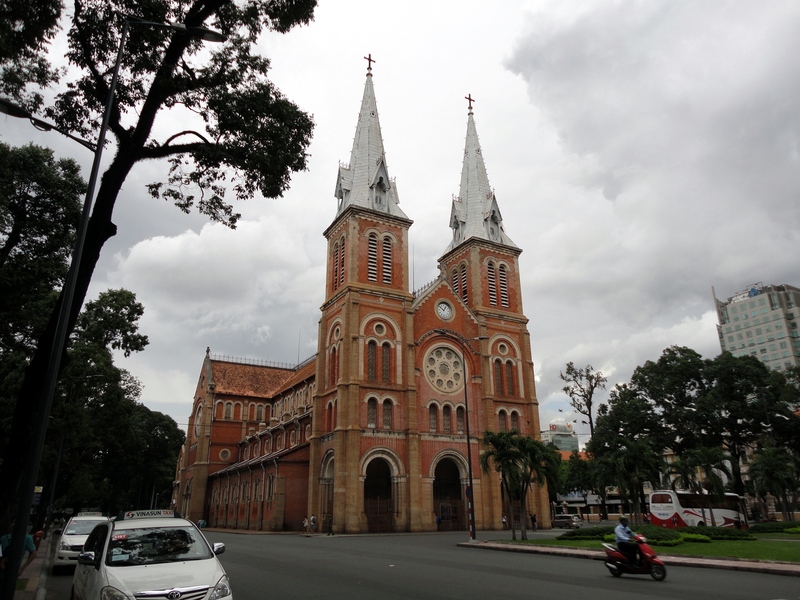 We also stopped at the St. Francis Xavier Catholic church, an attractive French-built church with a tall central tower, and went inside. 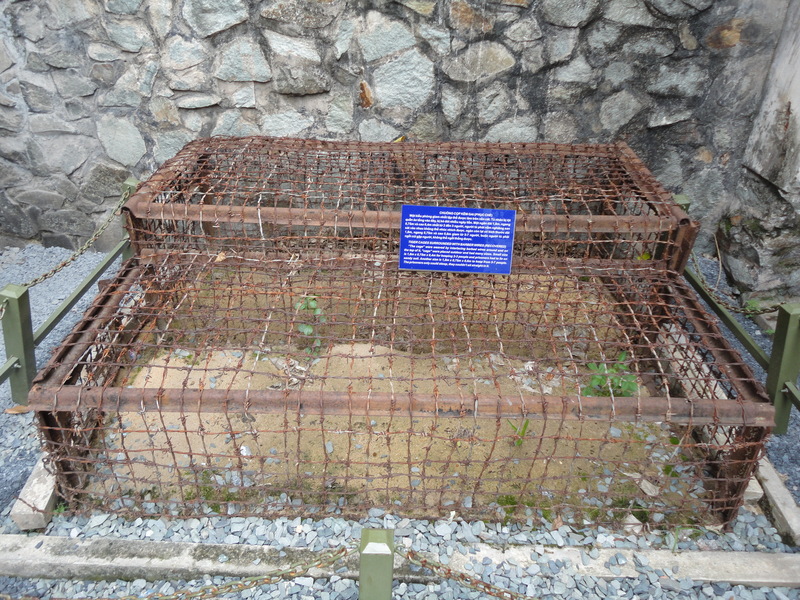 Right outside the front door is the grave of a former priest- a Father Tam. We happened to sit right behind a bench which had an inscription on it. 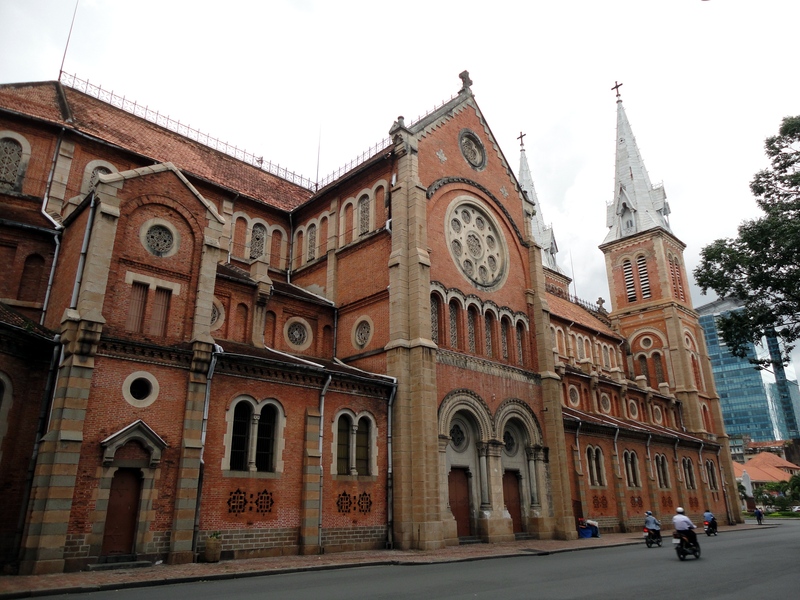 Apparently this was where former South Vietnamese President Ngo Dinh Diem and his brother were seized from after having fled into the church during a coup in 1963. 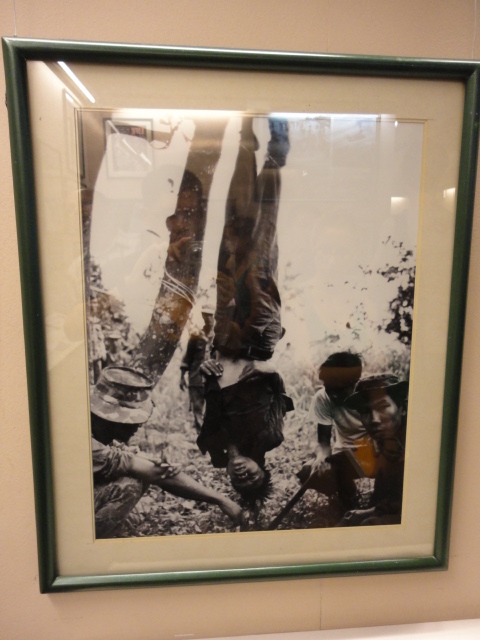 Diem and his brother, who ran the secret police, would later be executed in cold blood, though having been quite a dictator himself, little sympathy was given to Diem. Nevertheless it was a sad part of history to encounter. It was a good first full day in Ho Chi Minh City and a good tour, taking in history (museum, the church), religion (temples) and commerce (Cholon in general). 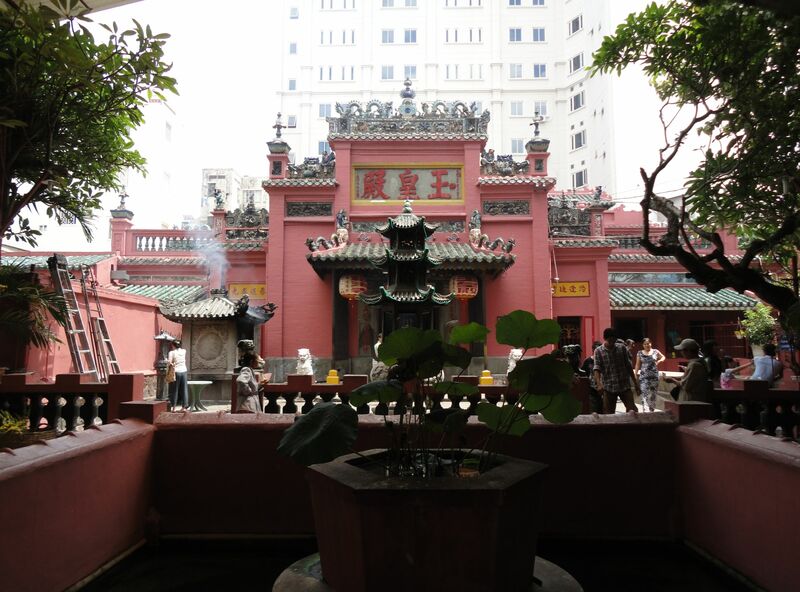 A Chinese temple in Cholon. 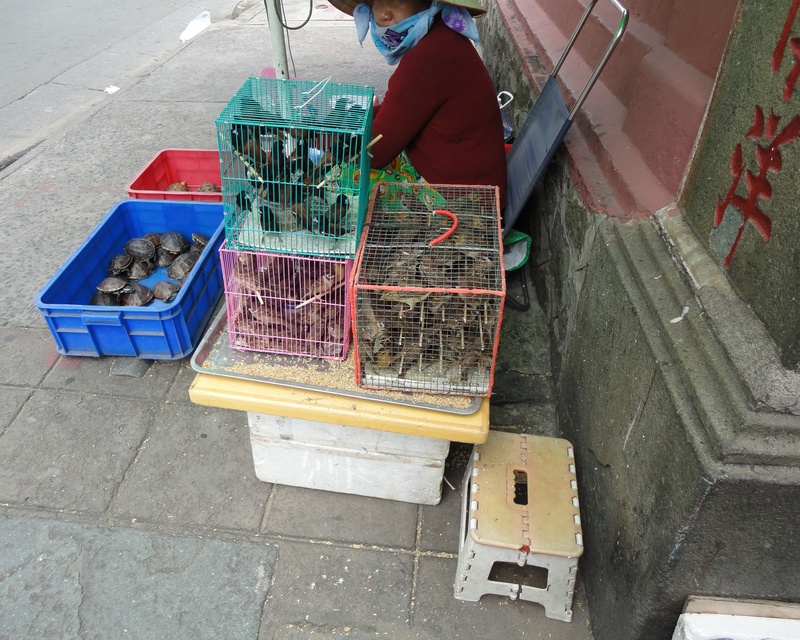 A vendor selling birds and turtles outside the Jade Emperor Pagoda. 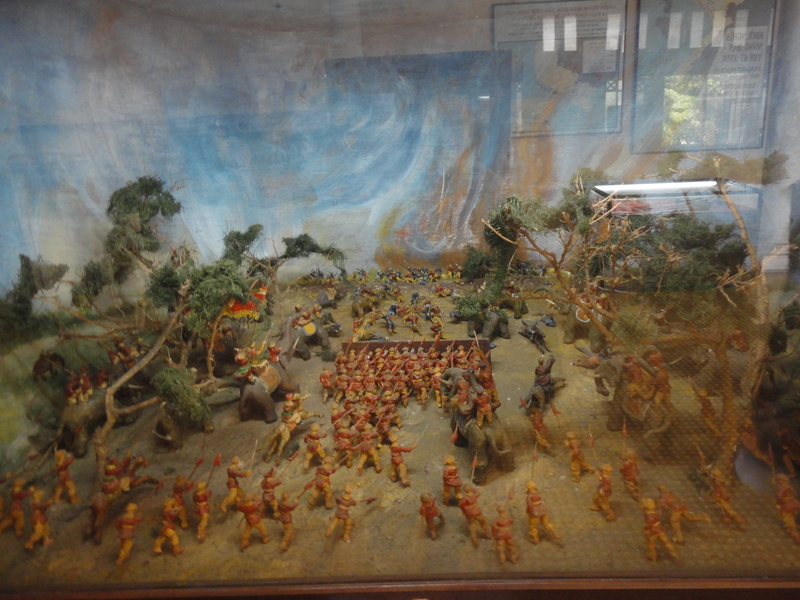 Another nice museum diorama depicting a conflict with China, this time the Qing Dynasty who were allegedly defeated. 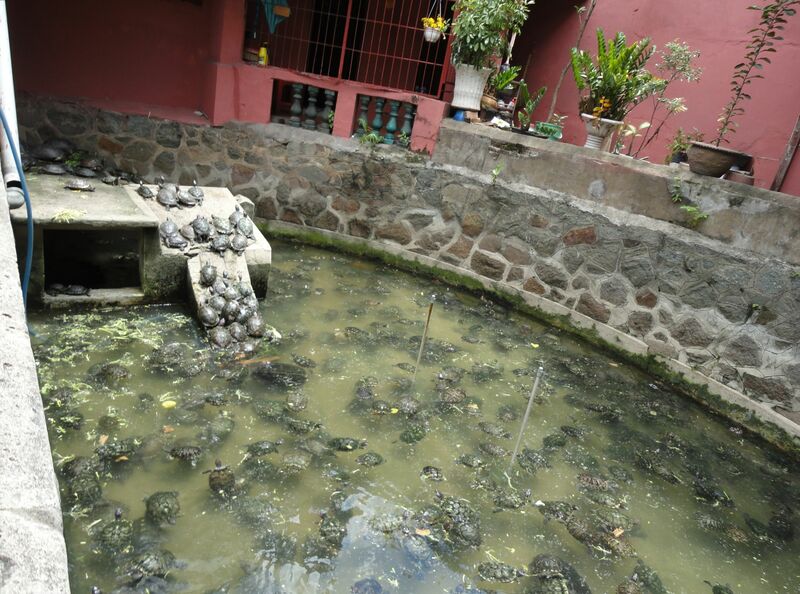 The turtle pond at the Jade Emperor Pagoda.